I hope you all have a fun and festive New Year's Eve, and a Happy New Year! Cajun Red Beans and Rice were a bit of a surprise hit. I knew I would like them, but I didn't know we would love them as much as we did. 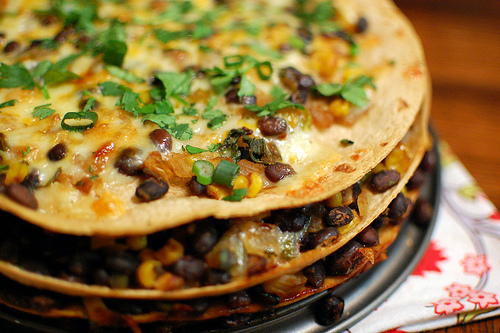 They are hearty, filling, spicy, and delicious. I was actually really sad that I only made a half batch. I'll definitely be adding these to the weekly menu in January. 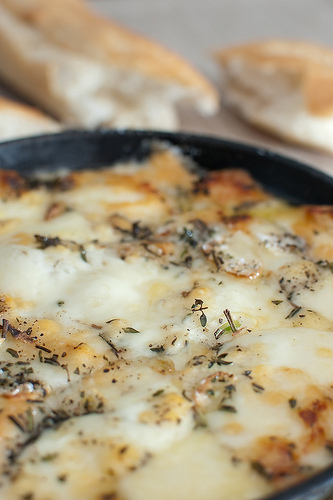 How could I not include the Baked Fontina? I have raved and raved about this recipe to anyone who will listen, and have already made it at least 3 times. 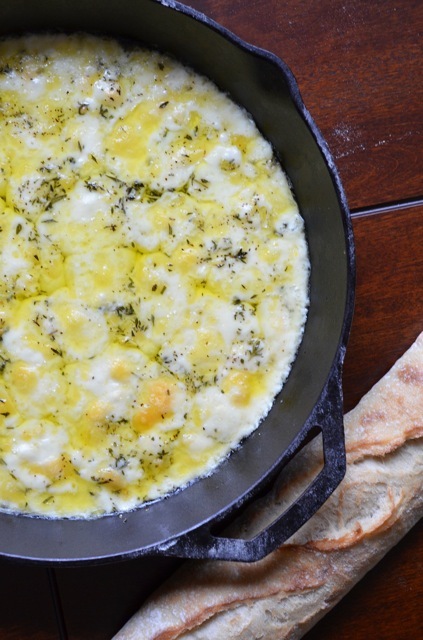 Bubbly, gooey cheese, garlic, and fresh herbs. This is my ideal treat. 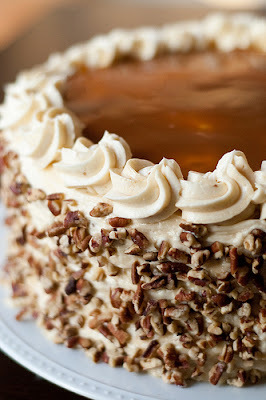 I'm including the Apple-Spice Layer Cake with Caramel-Swirl Icing because it is one of my proudest culinary feats. I had never been happy with a layer cake before I made this one - I always felt like they were leaning, crooked, or the icing didn't look great. But this one came out just as beautiful as I'd hoped. It was also super delicious - moist, spicy, sweet, and rich. Perfect, perfect, perfect. I hate to use the term "life-changing" because it is over-used, but seriously - these Chorizo, Potato, and Mushroom Tacos were pretty life-changing. A dinner that comes together in under 30 minutes, uses minimum ingredients, and is chock full of delicious and spicy flavor. 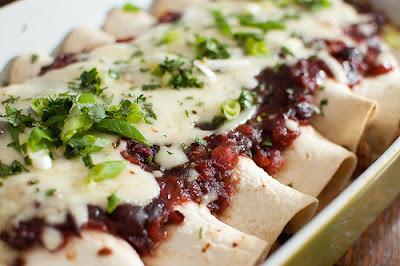 This is my favorite weeknight dinner, and I'm pretty sure that it's Joey's as well. 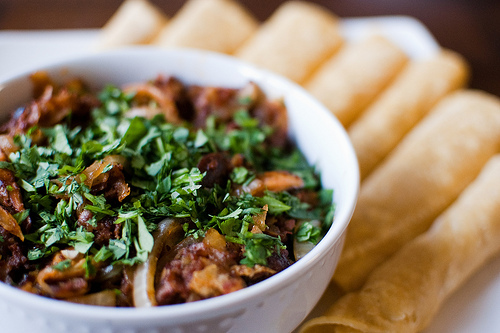 Don't forget the roasted tomatillo salsa! Sometimes a dinner is memorable because it's just awesome, and sometimes it's because of the memories that are associated with it. 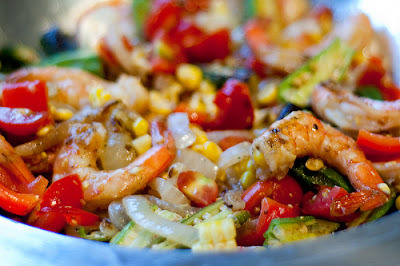 Maybe I loved this Grilled Shrimp Gumbo Salad because it capped off one of the best summer days we had this year. But I do know that it was healthy, quick, and delicious. I plan to eat my weight in this again next summer - the leftover are perfect served chilled, so I think I'll make a big salad every Sunday and enjoy this for lunches throughout the week. The fresh corn vinaigrette was also stellar, and makes a great dressing on side salads as well. 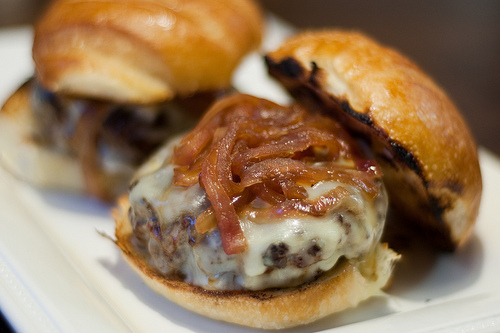 These Fig-Glazed Burgers with Red Onion Jam were another hit of the summer. Grilled burgers glazed with fig preserves, then topped with red onion jam and meunster cheese, they are a super fun and gussied-up burger that can be enjoyed year-round. Joey went so far as to say this is his new favorite burger, and I can't say I disagree. 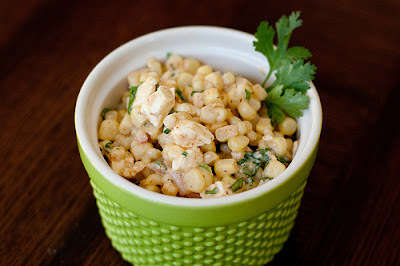 I'm pretty sure I made this Mexican Corn Salad every week for the entire summer. I've made countless variations on this recipe, from adding fresh diced tomatoes, to black beans, to avocado, to leftover grilled chicken. Even though corn isn't in season, I may try this with frozen corn. It's just too good to only eat in the summer. We joined a CSA this year, and as a result we had zucchini, squash, and tomatoes coming out of our ears. It's certainly a good problem to have, and I absolutely loved this summer vegetable gratin. This is great as a side with grilled meat, or served on its own with a green salad. This will definitely be in my repertoire for years to come. 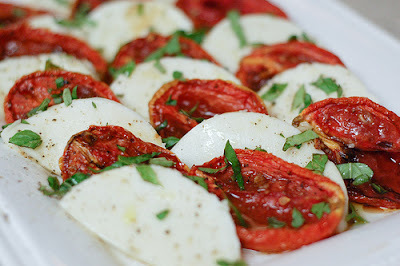 Roasted Tomato Caprese Salad was so popular with my best friend that I renamed it "Tomatoes Emilie." Sweet tomatoes, fresh mozzarella, and basil. So simple, so delicious. Even though I made this with height-of-summer tomatoes, Ina Garten says it is a great way to serve caprese salad with out of season tomatoes. I haven't tried it yet, but I have a feeling it will make an appearance sooner rather than later. This year was a breakthrough for me because I finally crossed over into the wonderful land of bread-baking. Although I originally had several other breads on this list, when I narrowed it down I couldn't leave this Jalapeno-Cheddar Sandwich Bread off. 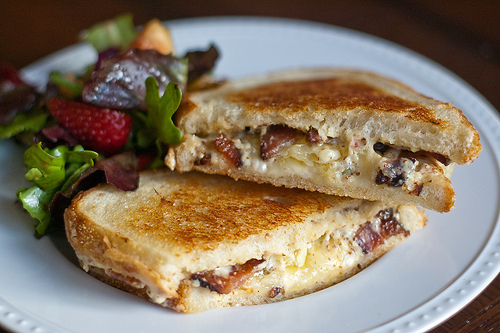 Cheesy, with just a hint of spice, this made the best BLTs ever this summer. 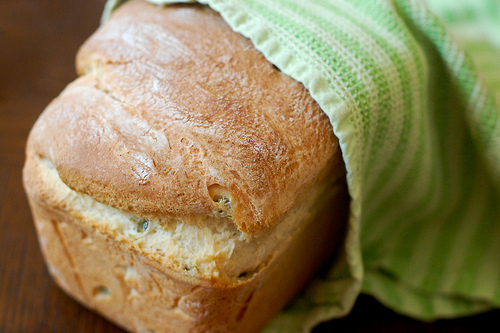 I'm pretty sure we ate BLT sandwiches for several nights in a row thanks to this bread. In fact, I think I should make another loaf and use it for grilled cheese or turkey sandwiches this winter. I hope you all enjoyed my round-up, and I'm already looking forward to all the deliciousness that I hope to share in 2011. 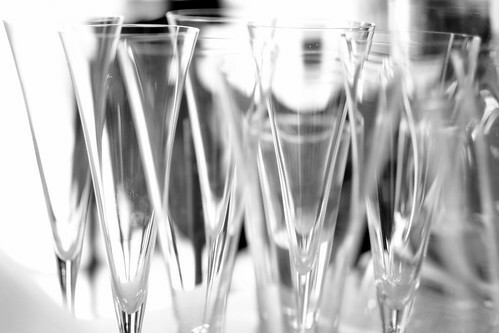 Cheers to a Happy New Year!!! In any case, this is quite literally one of the easiest things I've posted here. Just make a simple syrup, then soak the cranberries in it overnight (or up to a few days). Roll the cranberries in some sugar, and let them dry - and you're done! The simple syrup infuses the cranberries with a subtle sweetness, then the sugar coating gives them a nice crunch and of course sweetens them up even more. 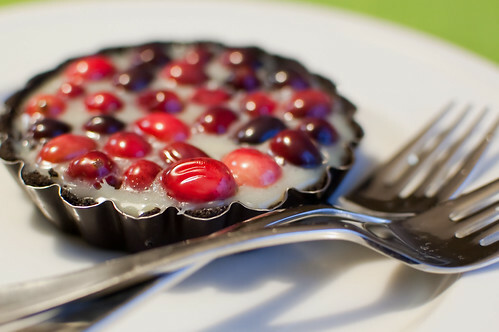 These pretty, sparkly cranberries were originally intended to be a garnish for the black and white cranberry tarts. However, the tarts were so pretty on their own that I didn't think these were necessary. Instead, they became a yummy snack! 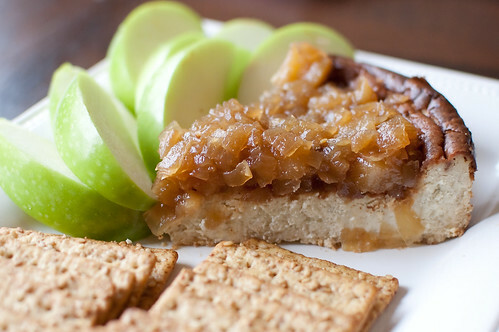 Crunchy and on the outside, tart on the inside. 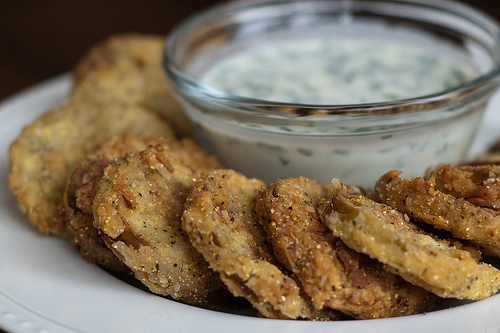 They keep really well, so they are an ideal snack to put out for holiday parties or unexpected guests. I know you can't tell from the picture, but they really do sparkle and glitter - so pretty! And Caroline went to town once these were finished - at least she's not scarred for life. In a medium saucepan, combine the sugar and water and cook over medium-low heat, stirring until the sugar dissolves. Bring to a simmer, and remove from heat. Stir in the cranberries, then transfer the mixture to a medium bowl. Cover and refrigerate at least 8 hours, or overnight. Drain the syrup from the cranberries (save it to make yummy drinks, or to soak a cake). Place the superfine sugar in a shallow dish, and add the cranberries. Stir lightly to coat completely, then transfer the cranberries to a baking sheet. Allow to dry at least one hour before serving. One of my favorite things about writing a food blog is "meeting" so many wonderful people. I've made some great friends through the food blogging community, and it makes me sad that I most likely won't ever meet most of them. Apparently Annie of Annie's Eats fame had similar feelings recently, because she decided to host a virtual holiday party and she invited me! Obviously I jumped at the chance to get to "cook for" some of my favorite food bloggers. 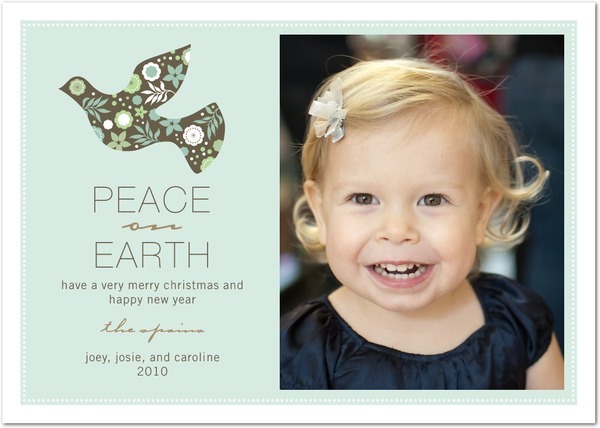 If I can't actually go to a blogger holiday party, attending a virtual one is the next best thing. 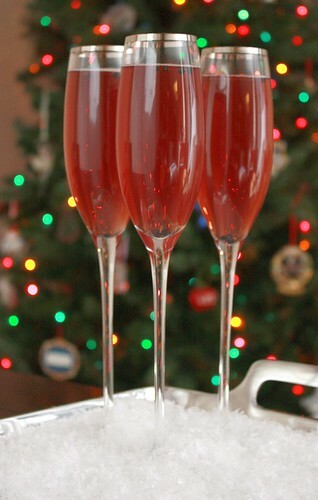 Tara from Smells Like Home made these cranberry-lime bellinis. 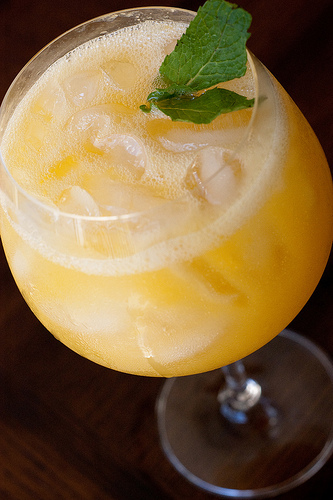 I love bellinis, and this twist looks really delicious. 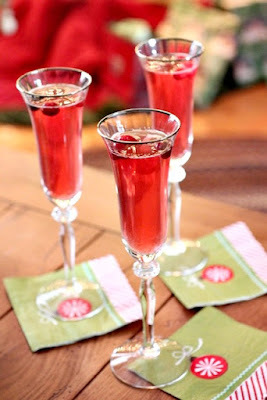 We typically drink mimosas at my mother's house on Christmas morning, but maybe I'll mix things up this year and serve this variation instead. Kelsey of Apple a Day went outside the box as well, with Pepper Berry Cocktails. They sound intriguing and look gorgeous, so I know I'd be a fan. I love cocktails that have a savory edge. Elly of Elly Says Opa was kind enough to serve us a Greek specialty, Dolmades. 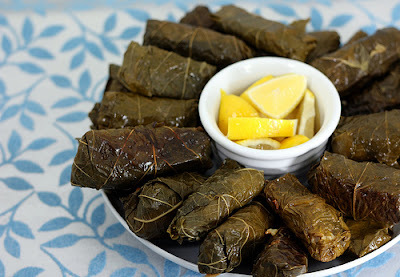 They are grape leaves stuffed with rice and herbs. I love Greek food, and while I've never even had a dolmade, I'd love to try some made by a Greek food queen like Elly! Nikki from Pennies on a Platter really spoke to me by making Baked Fontina. This is probably my favorite appetizer ever, so I would have just planted myself in front of the melted, gooey cheese and not moved all night. Though if anything could pry me away from melted cheese, it might be French macarons. Annie of Annie's Eats is a dessert maven, and while I've not yet tried to master the infamous macaron, I certainly can devour them. 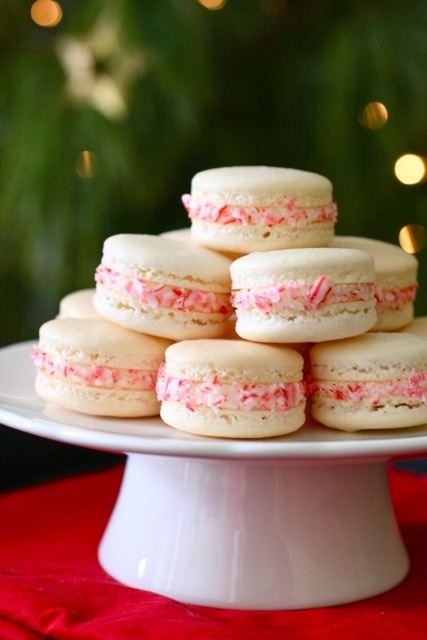 Candy cane macarons sound heavenly, and this variation might just force me to try my hand at them by Christmas. 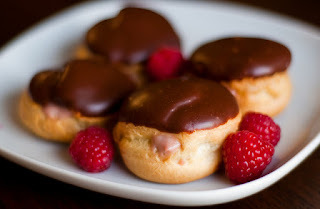 And finally, I contributed these raspberry cream puffs with chocolate glaze. I look up to and admire all of these ladies, so I wanted to impress them with a great dessert. I saw the idea for a raspberry filled cream puff in a food magazine this month (though I don't remember which one),but I turned to trusty Baking Illustrated to guide me through the process. I had never made pate a choux, and I know pastry can be fairly finicky, so I was a little nervous. Whenever I'm making a complicated recipe I just break it down and go one step at a time. It really makes it seem less daunting. So I first made the pastry cream, which I've made many times, then just went step by step for the puffs. No problems, easy as pie. I actually just adapted my favorite vanilla pastry cream to be raspberry flavored by adding some raspberry puree and preserves. It thinned out the pastry cream a little, but it still tasted wonderful. Thanks so much for hosting us Annie! I really hope that one day I'll be able to cook with these ladies - seriously, how fun would that be? 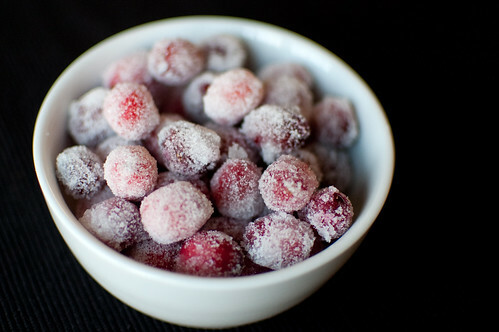 In the bowl of a food processor, puree the raspberries until smooth. Push through a fine-mesh sieve into a small bowl to remove seeds, and whisk in the preserves. Heat the half and half, 4 tablespoons of sugar, and the salt in a medium heave-bottomed saucepan over medium heat until simmering, sitrring occasionally to dissolve the sugar. Meanwhile, whisk the egg yolks in a medium bowl until thoroughly combined. Whisk in the remaining 1 tablespoon plus 1 teaspoon of sugar and whisk until the sugar has begun to dissolve and the mixture is creamy, about 15 seconds. Whisk in the cornstarch until combined and the mixture is pale yellow and thick, 30 seconds. When the half-and-half mixture reaches a full simmer, gradually whisk into the egg yolk mixture to temper. Return the mixture to the saucepan, scraping the bowl with a rubber spatula. Return to a simmer over medium heat, whisking constantly, until a few bubble burst on the surface and the mixture is thickened and glossy, about 30 seconds. Off heat, whisk in the butter and vanilla. Strain the pastry cream through a fine-mesh sieve set over a medium bowl, and whisk in the raspberry puree. Press a piece of plastic wrap directly on the surface to prevent a skin from forming and refrigerate until cold and set, at least 3 hours or up to 2 days. Preheat the oven to 425 degrees and line a large baking sheet with parchment paper. Beat the eggs and egg white in a measuring cup with a pourable spout. You should have 1/2 cup - discard the excess and set aside. Combine the butter, milk, water, sugar, and salt in a small saucepan and bring to a boil over medium heat, stirring occasionally. As soon as the mixture reaches a full boil, remove from heat and stir in the flour using a wooden spoon. Stir until the mixture is well combined and clears the sides of the pan. Immediately transfer the mixture to a food processor and process with the feed tube open for 10 seconds to allow the mixture to cool slightly. With the machine running, slowly add the eggs in a steady stream through the feed tube. Once all the eggs have been added, scrape down the sides of the bowl, then process 30 seconds, until a smooth, thick, sticky paste forms. Transfer the paste to a pastry bag fitted with a 1/2-inch round tip. Pipe the paste into 1 1/2 inch mounds on the prepared baking sheet, leaving about 1 inch between them. You should be able to fit 24 on each sheet. Dip the back of a spoon into a bowl of cold water and smooth the surface of the mounds. Bake for 15 minutes without opening the oven door. Reduce the heat to 375 and bake an additional 8-10 minutes, until the pastries are golden-brown and fairly firm. Remove the puffs from the oven, and using a paring knife, cu a 3/4-inch slit into the side of each one to release steam. Turn off the oven, return the pan to the oven, and prop the door open with the handle of a wooden spoon. Allow to dry until the centers are just moist but not wet, and the puffs are crisp, about 45 minutes. Transfer the puffs to a wire rack to cool completely. Place the half-and-half and chocolate in a microwave safe bowl. Heat 30 seconds at a time, until mixture is steaming. Whisk well after each heating, and stir well to melt the chocolate. Add the sugar and whisk until completely smooth. To assemble the cream puffs, use the tip of a paring knife to cut an "x" into the side of each puff. Fill a pastry bag fitted with a 1/4-inch round tip with pastry cream and pipe into each X until the cream starts to ooze back out. 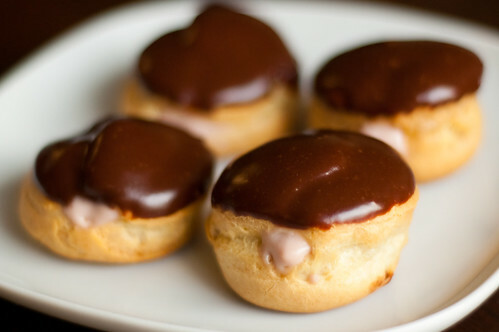 Dip the tops of each cream puff into the chocolate glaze, and allow to sit at room temperature until the chocolate is set. Serve immediately or refrigerate until ready to serve. I kind of hate to admit this, but until recently I wasn't really the biggest fan of red velvet cake. I didn't think it was anything special - just chocolate cake with way less chocolate than I prefer. Don't get me wrong - I still ate it - it is cake after all, and I've never been one to turn down cream cheese frosting. Now, however, I appreciate it much more for what it is - a soft and tender cake with just a hint of chocolate, and a nice tang from the buttermilk (or sour cream). Paired with cream cheese frosting, it is now one of my favorite cake flavors. 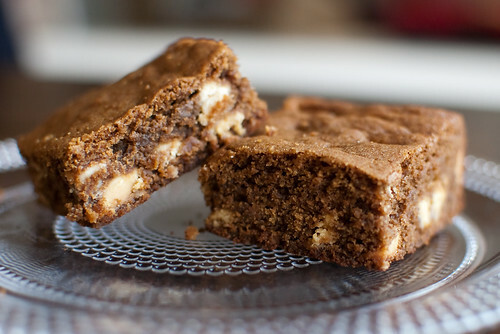 These brownies combine the fudginess of a good brownie with the tang of red velvet cake. 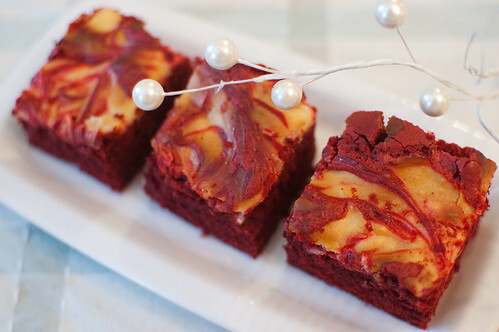 I was really excited when I saw this recipe, but upon closer inspection it just looked like a light chocolate brownie with red food coloring. To me, the defining characteristic of red velvet cake is buttermilk. So I added a bit of buttermilk, as well as some vinegar. I also opted to incorporate a cream cheese swirl rather than using frosting. The end result was rich and fudgy like a good brownie, but had the flavors of a good red velvet cake - the best of both worlds if you ask me. Preheat the oven to 350 degrees. Line a 9x9 inch square baking dish with two pieces of aluminum foil, folding ends over the edges. Spray with cooking spray. Combine the chocolate and butter in a large, microwave safe bowl. Cook 30 seconds at a time until melted, stirring well after each time. Whisk in the sugar. One at a time, add the eggs, whisking well between each addition. Stir in the flour, food coloring, baking powder, salt, buttermilk, vanilla, and vinegar. Combine well, then pour into the prepared baking dish. In the bowl of a stand mixer fitted with a paddle attachment, beat the cream cheese, sugar, vanilla, and egg yolk. Drop spoonfuls over the brownie batter, then use a table knife to swirl into the batter. Bake 40-50 minutes, or until a toothpick inserted into the center comes out with just a few crumbs attached. Allow to cool completely before slicing. 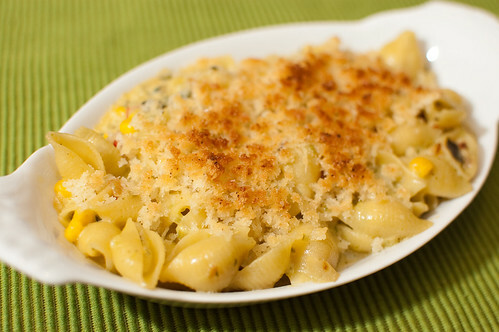 Is there any food out there that's more comforting than macaroni and cheese? I certainly can't think of one. I absolutely love macaroni and cheese, and I love finding fun and unique variations even more. I have a standard baked recipe that has never let me down, but I like to branch out and try other combos as well - shrimp and feta, fontina, and now this spicy green chile mac and cheese. This particular recipe was in December's Bon Appetit, and it stopped me dead in my tracks when I saw the title of the recipe. I immediately added it to the menu for the week, but upon closer examination of the recipe, I knew it would need some major tweaking to suit our tastes. I really love how a poblano is first roasted and peeled, then pureed. 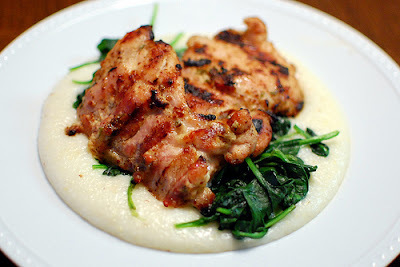 The puree is then added to the cheese sauce, and every bite is permeated with that delicious, smoky, roasted poblano taste. However, the recipe only called for 1/2 cup of cheese! How is that possible? So I tripled it, and while I was at it, used a combo of sharp white cheddar with the pepperjack. I just love the combination of those two cheeses. I also added some extra peppers, and subbed half and half for heavy cream. Since I used so much extra cheese, I figured I'd save some calories where I could ;-). Finally, I topped the final product with some cayenne-laced panko and broiled the whole thing for a few minutes. I just love a good crunchy top. I for one have no problem eating macaroni and cheese as my main dish - paired with a salad for some extra veggies, it is actually one of my favorite meals. But this would be a great side dish to grilled steaks or pork as well. 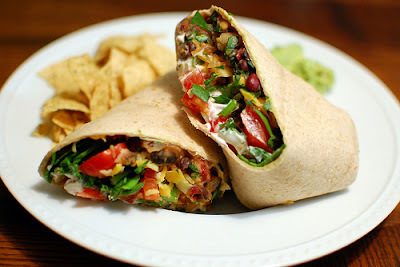 I'd been battling a cold for several days, and when I made this the combination of poblano, jalapeno, and pepperjack sure did clear my sinuses! Bring a pot of salted water to boil. Add the pasta and cook until al dente, 8-10 minutes. Drain and set aside. Preheat broiler. Meanwhile, char the whole chile directly over a gas flame or in broiler until blackened on all sides. Transfer to a glass bowl, cover with plastic wrap, and let stand 10-15 minutes. Peel, seed, and coarsely chop the pepper. Transfer to a food processor and puree until smooth. Heat oil in a large skillet over medium-high heat. Add the chopped poblano, bell pepper, onion, and jalapeno. Saute until soft, 4-5 minutes. Add the garlic and season with salt, and cook until fragrant, about 30 seconds. Ad the corn and stir one minute. Add the half and half and chile puree and bring to a boil. Add the pasta and both shredded cheeses, and stir until cheese melts and the mixture is heated through. Season with salt and pepper. 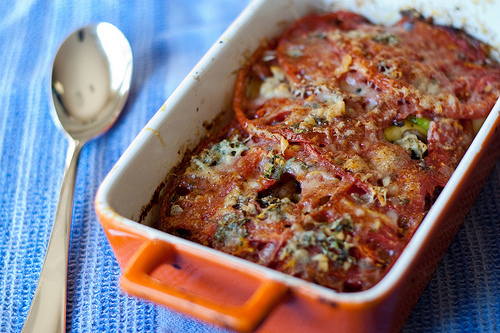 Evenly divide mixture into a lightly greased oven-safe gratin dish or ramekins. In a small bowl, combine the panko, butter, and cayenne and toss with a fork. Sprinkle mixture over the macaroni and cheese. Place under broiler for 2-3 minutes, or until panko is lightly browned and mixture is bubbly. It seems like every season I develop an obsession with a particular ingredient. This spring it was asparagus. The summer had me obsessed with tomatoes, and this fall was the apple. I'm going to go out on a limb and proclaim this year's holiday obsession to be gingerbread. Or maybe I shouldn't limit it to gingerbread, and just go with ginger instead. Regardless, I've been enjoying gingerbread oatmeal in the morning, cake, gingersnaps as a snack, and now these whoopie pies. 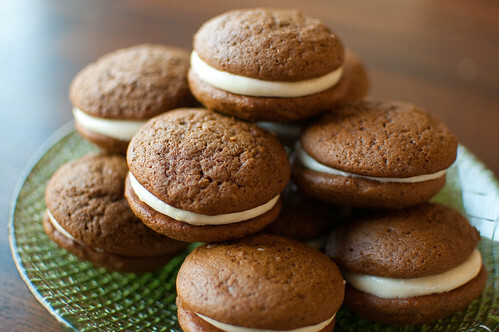 At the end of last year, The New York Times proclaimed whoopie pies to be the new cupcake. 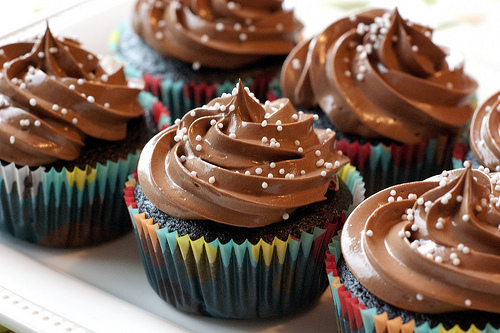 Now, I'm not sure if they can replace cupcakes, but they are a lot of fun. 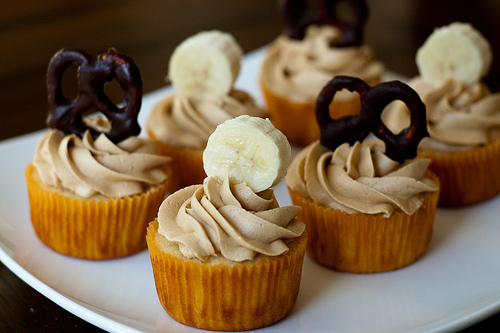 They have everything going for them that cupcakes do, plus they are portable and neater to eat. In a medium bowl, whisk together the flour, salt, baking soda, and spices. In the bowl of a stand mixer fitted with a paddle attachment, cream the butter and sugar at medium speed until light and fluffy. Mix in the egg, beating until incorporated, scraping down the sides of the bowl if needed. With the mixer on low speed, mix in half the dry ingredients. Add the molasses, then the remaining dry ingredients. Finally, add the buttermilk, mixing until just incorporated. Use a medium cookie scoop or a pastry bag fitted with a round tip to form the cookie shapes on the prepared baking sheet. Space the cookies a few inches apart, and bake 9-12 minutes, rotating the cookie sheets halfway through, until the cookies are cooked through and spring back when lightly pressed with your finger. Remove from oven and allow to cool 5 minutes, then transfer to a wire rack to cool completely. Repeat with remaining dough. Meanwhile, make the filling. In the bowl of a stand mixer fitted with the paddle attachment, cream the cream cheese and butter until smooth and creamy. Add the vanilla, lemon extract, and lemon zest, and mix to combine. With the mixer on low speed, slowly add the sugar. Once it is incorporated, increase the speed to medium and beat until light and fluffy. Match the cookies together by size, and pipe or spread filling over half the cookies. Form sandwiches with the remaining halves, and serve or store in an airtight container. I feel like I need to apologize. See, I try to post a good variety of healthy dinners, with a few indulgent meals and treats thrown in. But it seems like lately I've been sharing more and more sweets and fewer healthy dinners. I feel like maybe I should apologize, but hey - they're all delicious, so I don't feel that bad. Plus, it's the holidays - and people want sweets at this time of year! However, people also want snacks and appetizers. 'Tis the season for cocktail parties and potlucks, and when I can, I like to take a healthy option. There are sure to be plenty of dishes filled with cheese, butter, meat, etc. 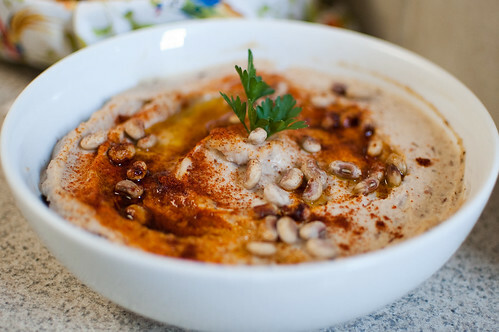 One of my favorite things to make is hummus, and this is a fun twist. You can really make hummus out of any bean: black beans (which is Joey's favorite), white bean, and of course the classic hummus made with chickpeas. If you've been reading my blog for a while, you may remember the Beer Pairing Dinner that Joey and I hosted this summer, and I served this as a bonus course while people arrived and milled around. I actually made the accompanying corn bread sticks to use as dippers, and while they tasted fine, I wouldn't recommend them simply because they broke when dipped into the hummus, and were a bit dry as well. Pita chips are just fine with these, as are corn chips and veggies. This week's Project Pastry Queen dish was chosen by the fabulous Tara of Smells Like Home. The original recipe is for Grasshopper Pie, but one of the "Rather Sweet" Variations is to turn the pie into parfaits. I opted to do this because Joey and I do not need a whole pie sitting around, waiting to be eaten. So I halved the recipe and made parfaits instead. And don't they look so pretty and festive? This recipe is pretty simple: Oreo pie crust, minty marshmallow filling, hot fudge sauce. 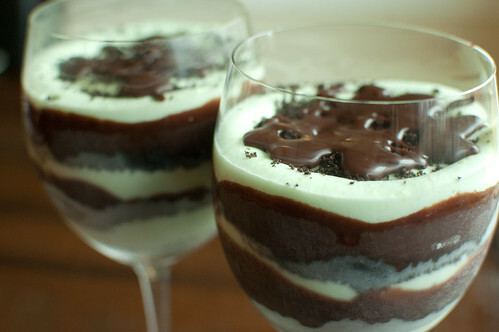 And since everyone is pretty crazy for chocolate + mint around the holidays, this would be a great dessert to take to a potluck or dinner party. Especially since it can be made weeks ahead and is served frozen. I didn't really make many changes - mostly I just added more mint flavor because I felt like it was more of a "mint essence" on its own. First, I used Candy Cane Joe Joes from Trader Joe's for half the oreos. And let me just stop for a minute and say that if you have a Trader Joe's nearby, get yourself there as soon as possible and buy these. If an Oreo and a Thin Mint had a love child, it would be a Candy Cane Joe Joe. So addictive. So like I was saying, I used half classic oreos and half Joe Joes. I also added a little extra Creme de Menthe to the marshmallow filling as well as to the chocolate sauce. And as a side note, the recipe calls for green Creme de Menthe, but given my tendency to skim the ingredients before going to the store, I bought clear. I thought "no big deal, they'll just be white and black instead of green and black." But what I failed to realize is that the filling has 2 egg yolks in it, therefore has a yellow-ish tinge that wasn't so attractive. I just added a few drops of green food coloring though, and it turned out just fine. 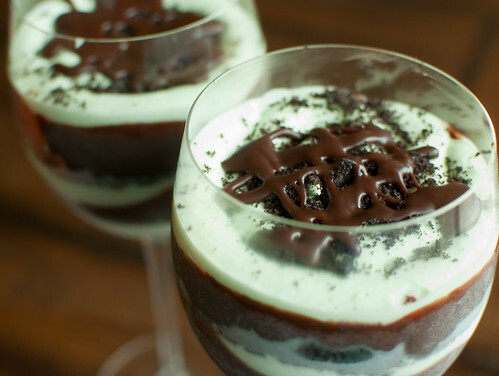 To turn the pie into parfaits, simply crush the oreos, then layer the oreos, hot fudge sauce, and marshmallow filling in glasses. You want at least 2 layers of each component. 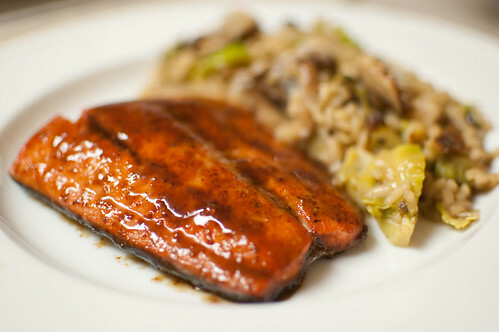 Freeze for at least 3 hours, and serve with more hot fudge sauce. Tara has the full recipe posted on her blog. Check it out for a fun holiday pie, or turn it into elegant parfaits. Next week: Rocket Rolls! "Beth was sweeter than her fudge." These were the first words delivered at my grandmother's funeral. And they rang true. My grandmother, or rather step-grandmother really, though I never considered her to be "step," was famous for both her loving nature and her fudge. I've mentioned before that I have the best grandfather in the world, and his devotion to Beth is just one of the many reasons. She had a series of strokes the day after Easter in 2004. They left her paralyzed pretty much from the neck down. She was admitted into a rehabilitation center, and lived there until she died in September of 2006. Twice a day, every single day, Pop visited her for a minimum of 2 hours. Every. Single. Day. My sweet Pop was the most devoted husband I've ever seen. And this was the second wife he'd buried. I just marvel at that commitment and love, and I can only hope that Joey and I still feel that way about each other when we're old and gray (or bald, as in Pop's case)! Every year she literally made dozens of pounds of her fudge. It's nothing out of the ordinary - just a classic chocolate fudge, but there was something special about hers. It was always the perfect consistency. 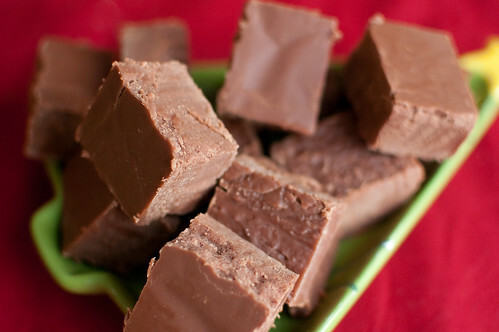 And super sweet - which some may complain about, but it's fudge. What do you expect? She would "grudgingly" say at Thanksgiving every year that it was time to start the great fudge-making extravaganza, and we all looked forward to Christmas because she always brought it to our gatherings. And we'd usually smuggle some home. Luckily, she shared her recipe with my mom, who has now shared it with me. 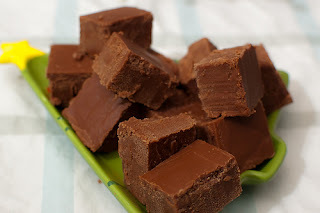 A candy thermometer is absolutely vital for this fudge: if the mixture isn't hot enough, it won't set. If its too hot, it will be grainy and dry. So 238 degrees Farenheit exactly is what you want. Other than that, it is very straightforward and simple: Melt the sugar, marshmallows, butter, and milk together to reach 238, then mix in the chocolate, vanilla, and cream of tartar. Easy peasy. With 5 cups of sugar, this is not for the faint of heart. However, it is one of the most nostalgic treats out there for me, and I can't help but to feel closer to her when I make it. In fact, I made a batch recently, and gave a tin of it to Pop for his birthday. He was quite excited to be able to enjoy this fudge again after all these years, and now that Joey has proclaimed it to be "the best fudge ever," I hope to carry on her tradition for years to come. In a large stockpot, melt together the milk, sugar, marshmallows, and butter over medium heat, stirring often. Bring to a boil and heat to 238 degrees. Meanwhile, line a 9x13 inch bakign dish with foil and spray with cooking spray. Remove from heat, and using an electric mixer, beat in the chocolate chips, cream of tartar, and vanilla extract. Fold in the nuts, if using. Carefully but quickly, pour the mixture into the prepared pan, and use a spatula to smooth the top. Allow to set before cutting into squares. It's my turn again for Project Pastry Queen, and as usual, I struggled immensely with my choice. We've just had Thanksgiving, so I felt like everyone was over pumpkin. It's not quite Christmas, so I didn't think a giant cake was appropriate. Maybe something savory? Maybe a salad? But I just couldn't resist these pretty little tarts. 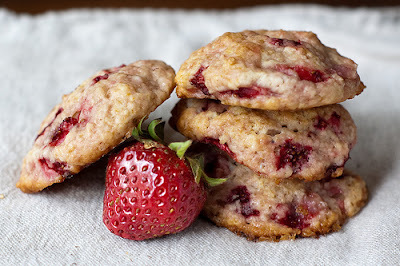 Cranberries are one of my favorite things to bake with, and let's face it. You can't go wrong with an oreo crust and white chocolate filling. So the choice was made. I have to admit that I was a little surprised to see that you don't bake the crusts at all. However, this presented a problem when it was time to remove the tarts from the pans, and after I broke one tart, I decided to just serve them in the tartlette pans. No big deal, but I will definitely bake the crusts for 10 minutes or so next time I make them. The cranberries are just barely cooked - really just heated through enough to absorb some sugar and cut the tartness a bit. Left whole, it creates quite a striking dessert - especially with the contrasting colors of the black crust, white chocolate ganache filling, and bright red cranberries. I think these would translate well into a large tart, and I plan to make one for one of the several Christmas functions we'll be attending this year. Festive, gorgeous, delicious, and most importantly easy. Check back next week: We're making grasshopper pie! To make the crusts, preheat the oven to 350 degrees. 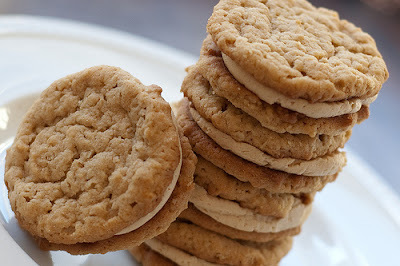 Process the cookies in a food processor until ground to coarse crumbs. Pour in the melted butter and pulse until well-combined. Press the mixture into the bottom of eight tartlet pans. Bake 10 minutes, and set aside. To make the filling, place the choped white chocolate in a large bowl. In a medium saucepan, heat the cream, butter, and corn syrup to the boiling point. Pour over the white chocolate and whisk until smooth. Combine the cranberries, water, and sugar in a medium saucepan and warm over low heat about 5 minutes. Do not let the cranberries get hot enough to pop. Drain the cranberries well, discarding the liquid. 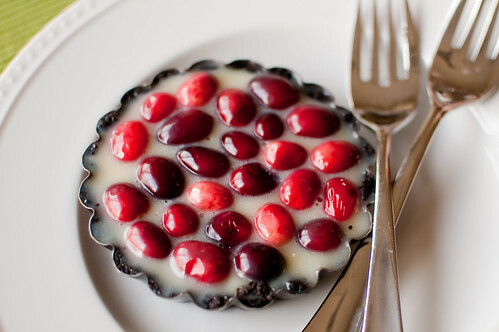 Fold the cranberries into the white chocolate mixture and pour evenly into the tart shells. Refrigerate at least 2 hours or overnight. Remove from tart pans and serve. A few weeks ago, I handed Joey The Perfect Scoop and told him to pick out an ice cream. Since I had made sweet potato ice cream recently, and it wasn't his favorite, I thought I'd be a good wife and make something he would enjoy. I was actually a little surprised when he chose this one because he usually goes for something more classic and simple. But I was game. I love the combination of chocolate and cinnamon, and I was intrigued by the addition of chile powder. It seems that adding spice to chocolate is all the rage right now, so consider me on the bandwagon. The ice cream base is a smooth, rich dark chocolate. You then add in the cinnamon, cayenne, and chile powder. When I first tasted the ice cream, I was surprised by how much it actually tastes like hot chocolate. Then came the kick from the cayenne. Its pretty subtle, and oddly addicting. 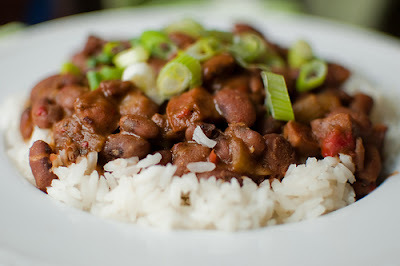 You just keep going back for more to dissect the flavors and achieve that perfect balance of sweet, smooth, and spicy. David Lebovitz recommends using ancho or chipotle chile powder, but I actually didn't have either one on hand. Since they tend to be more spicy than standard chile powder, I opted to add a little cayenne in addition to it. I think this gave the ice cream the perfect amount of heat without being overpowering. This was definitely a fun and unusual ice cream, and would be a fun conversation piece if you served it at a party. 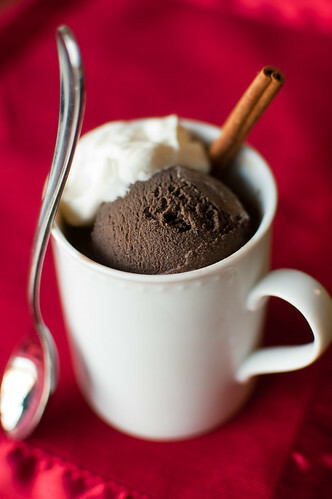 I think it would be especially fun to make hot chocolate "affogato" with it. 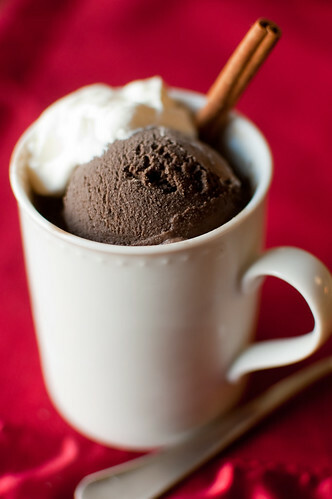 Just pour some hot chocolate over the ice cream, and serve. Whisk together the cream, cocoa powder, and sugar in a large saucepan. Heat the mixture, whisking frequently, until it comes to a full, rolling boil. Remove from heat and add the chopped chocolate, whisking constantly until it's completely melted. Stir in the milk, vanilla, salt, cinnamon, chile powder, cayenne, and brandy. 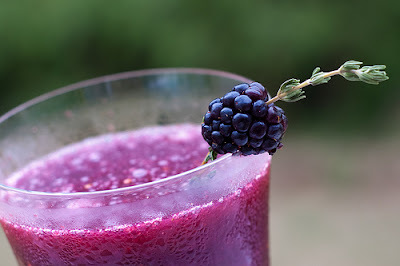 Pour into a blender and blend for 30 seconds, until very smooth. Chill for several hours in the refrigerator, then freeze in the ice cream maker according to the manufacturer's instructions.